Exhumation is the process through which rocks are brought to the surface of the Earth. The cooling history of an orogen (a mountain belt created by the collision of tectonic plates) is strongly correlated with its exhumation; i.e. rocks which are exhumed quickly from depth will also undergo fast cooling. However, many important questions related to orogenic exhumation and cooling are not well understood. For example, Proterozoic (2500 – 540 million years old, or Ma) orogens generally record slow, extensional cooling histories, whereas cooling in younger Phanerozoic (540 – 0 Ma) orogens is much faster, and may involve compressional tectonic activity such as thrusting. Some evidence suggests that this difference in cooling rates and exhumation processes between old and young orogens is related to the preservation potential of the geological record of orogenic cooling, although it may also reflect a fundamental change in orogenic processes through time. Furthermore, although the influence of compressional activity on exhumation has been acknowledged, this relationship has not previously been studied in detail. Finally, a correlation between orogen type, orogenic exhumation and the volume of juvenile crustal growth (new continental crust, as opposed to the reworking and remelting of existing crust) suggests that crustal domains may experience different exhumation histories based on their magmatic history. The Albany-Fraser Orogen is a Mesoproterozoic (1600 – 900 million years old, or Ma) orogen located on the south and southeast margins of the Yilgarn Craton of Western Australia. The orogen is considered to record the ca 1350 – 1150 Ma collision and suturing of Western Australia to the joint Mawson and Gaweler Cratons of East Antarctica and South Australia, during the formation of the supercontinent Rodinia. During orogeny, the rocks of the Albany-Fraser Orogen were deformed at mid-crustal levels to amphibolite or granulite facies, and were quickly exhumed to shallow crustal levels after the end of orogeny (within 20 Ma in the western part of the orogen). The well-preserved record of high-grade deformation and fast exhumation in a Proterozoic orogen make the Albany-Fraser Orogen an ideal location to study orogenic exhumation and cooling. a)	What is the role of compressional tectonic activity in the exhumation of collisional orogens? What was the effect of the regional transpressional tectonic regime on the cooling and exhumation of the Albany-Fraser Orogen? b)	What is the cause and significance of fast cooling in Proterozoic collisional orogens? What are the causes and tectonic implications of fast cooling in the Albany-Fraser Orogen, and how does this compare to the cooling histories of other Proterozoic orogens? c)	How do crustal growth events and the subsequent magmatic differentiation within a domain affect the ultimate exhumation of that domain? Can differences in the exhumation histories of domains in the Albany-Fraser Orogen be related to pre-orogenic crustal growth or differentiation events? The tectonic evolution of a region is crucial in determining its exhumation history. Why do you see what you see at the surface? Exhumation is an important geological process to understand as it controls when, where and how rocks are exposed, and in turn influences sediment production and the composition of the sedimentary record. At a more regional scale, the Albany-Fraser Orogen records a vital stage in the assembly of the supercontinent Rodinia, but has been largely overlooked and understudied in the past as the region was not considered prospective for minerals exploration. This has changed with the recent discoveries of the Tropicana gold (AngloGold Ashanti, 2005) and Nova nickel deposits (Sirius Resources, 2012). 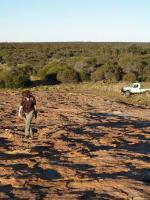 These discoveries resulted in a major ongoing research campaign by the Geological Survey of Western Australia to increase our understanding of the geological history of the Albany-Fraser Orogen. Current and pre-existing research efforts in the Albany-Fraser Orogen are focused on the pre- and syn-orogenic magmatic and deformational history of the orogen, and my work will fill an important gap in knowledge by focusing on the late- and post-orogenic processes responsible for bringing the rocks of the orogen to the surface.